Last weekend Cheryl requested I make a chicken dish she likes I hadn’t made in a while, chicken thighs with olives. 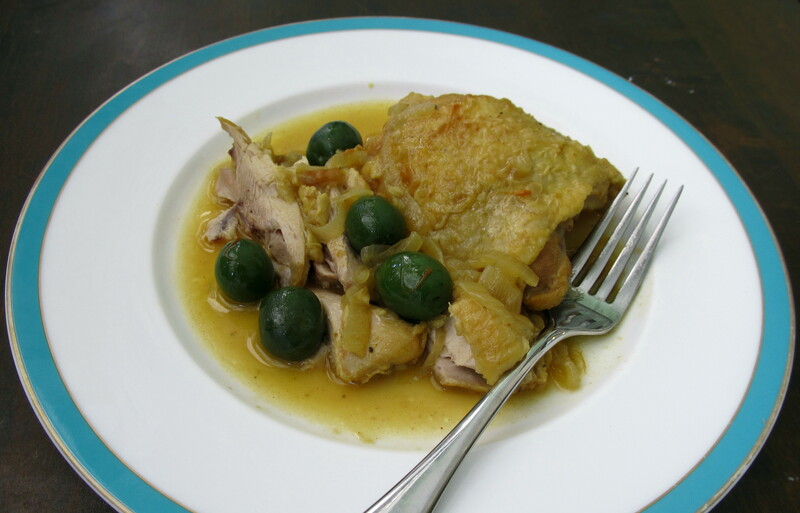 I have two chicken with olives dishes so after asking further questions to narrow down which one, I figured chicken thighs with saffron and green olives was what she wanted. Of course, it was the other one. Nevertheless it’s a flavorful dish and makes for a very good Sunday or weeknight dinner, especially in the fall. I learned this particular chicken dinner from Molto Mario. It’s in one of his cookbooks I have and according to him it was a staff favorite when it would appear on the menu at his first restaurant. His is a little different than mine since I put my own spin on ingredients, but the base and technique are similar. One thing which really amazed me years ago when I was first starting out cooking for myself was how the sauce thickened. After years of cooking and learning I now know it’s because of the flour you dredge the chicken in. Those little bits hang around in the pan and you end up kind of making a roux. I guess for me it still never gets old how just that small amount will help thicken this saffron sauce just right. Despite Cheryl wanting my other chicken dish, this is one of my favorites to cook mostly because I think chicken thighs are a great protein to use. They are full of flavor, juicy, and you can cook them in a pretty short amount of time or even let them go longer as there’s no fear of overcooking and drying them out (braising also helps!). Not only that but chicken thighs are pretty inexpensive compared to chicken breasts. I know it’s cliché and been said many times but the cheapest cuts usually do make the most delicious meals. You don’t need a lot of liquid in the pot when you get ready to put the chicken back in since the onions really cook down and release their water into the sauce. I don’t think I need to tell you the leftovers are great and don’t usually last long so make sure you have enough! Heat the butter and oil in a Dutch oven over medium-high heat. Season chicken thighs with salt and dredge in the flour. Brown 3 chicken thighs in the Dutch oven, remove and set aside. Repeat for all of the chicken pieces. Add the sliced onions and garlic to the pot, stirring them around until the onions cook down in size, about 3-4 minutes. Stir in the saffron and add the wine. Scrape up the bits on the bottom of the pot. Pour in the water and any juices from the chicken thighs, bring to a boil. Return the chicken to the pot, bring back to a boil, reduce heat to a simmer and cover. If sauce is not thick enough reduce until desired consistency. Next Post The Easiest French Onion Soup! Seriously. I’m notthat impressed with saffron. I even hadmy daughter bring me back some from Spain when she lived there. Maybe I’m expecting too much? Love the color it imparts,tho. Great chicken dish, even if it was the wrong one. Thanks! Love using chicken thighs. I think there’s definitely a love/hate thing with saffron probably because it is one of those spice where too much gives a horrible flavor (kind of like nutmeg) and aroma.